It’s time to celebrate the 4th of July! The Independence of the USA – a great American holiday! And what better way to celebrate than with cupcakes! 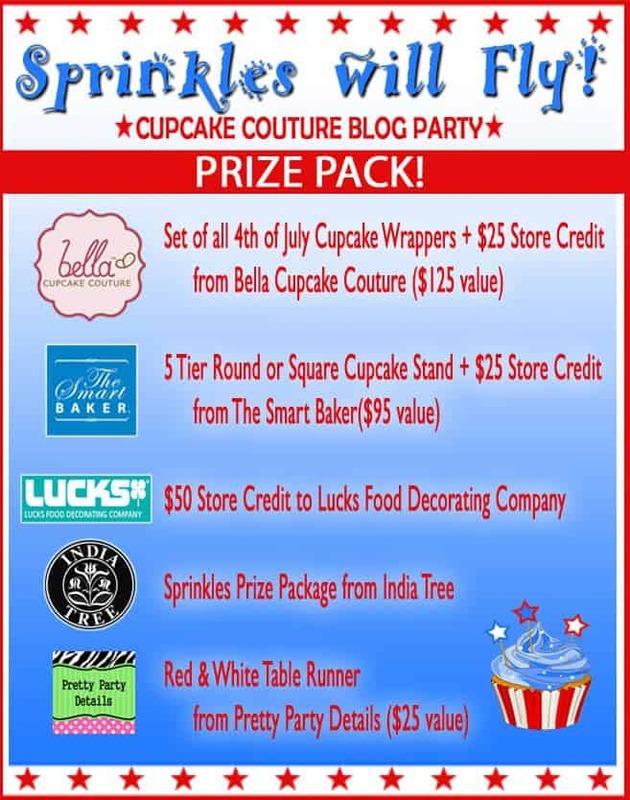 I’m super excited to be a part of another Blog Party featuring so many delicious cupcakes wrapped in Bella Cupcake Couture! 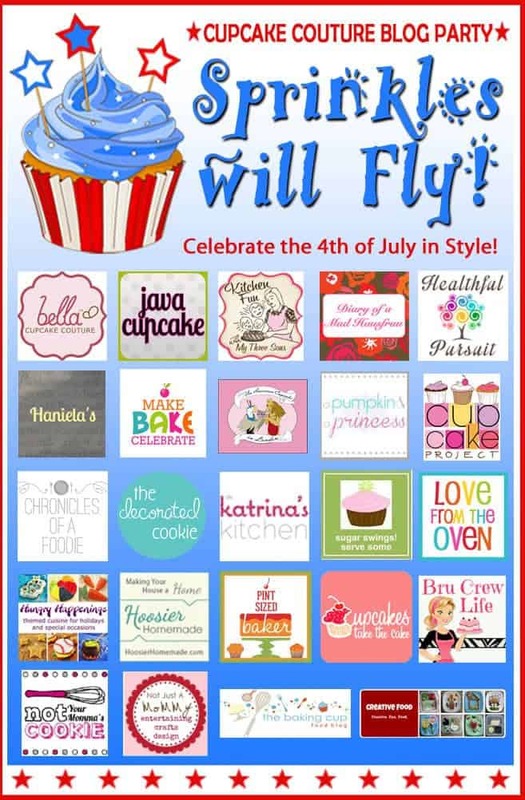 23 blogs created 23 different cupcakes all dressed in patriotic cupcake wrappers from Bella Cupcake Couture… all with one purpose… to INSPIRE YOU to create these at home for your friends and family on the 4th of July! We wanted to show you how easy it is to make a delicious cupcake and make it beautiful for your party too! Make sure to check out all the other blogs to see their creations! There are some seriously yummy looking cupcakes here! The cupcakes I created for this party were Cherry Red Velvet Cupcakes! Yum! Rich red velvet cake filled with cherry pie filling and topped with a coconut cream cheese frosting. The red cake and white frosting paired with the blue and white wrappers from Bella Cupcake Couture make the perfect patriotic treat! Since these will be served at a backyard BBQ, I wanted to keep the setup super simple. I displayed the cupcakes on a glass plate and used a two tier stand to set the plates on. I wanted the backdrop of the cupcakes to be the green grass, the yard, the blue sky and the party. Very informal, but still super pretty. Preheat oven to 350 F degrees. Line cupcake pans with liners. In the bowl of your stand mixer, cream together the butter and sugar for 3-4 minutes. Add the eggs, one at a time, and mix until incorporated after each egg. In a small bowl, combine the red food coloring, cocoa powder and vanilla extract until it turns into a paste. Add this paste to the butter and eggs and mix until combined. Add the flour and buttermilk, alternating. Begin and end with the flour. Mix only until just combined. Mix in the vinegar. Do not over mix the batter! Scoop batter 2/3 full into the prepared liners. Bake 17-19 minutes or until a toothpick comes out clean. Allow to cool in pans for about 5 minutes before removing to a wire rack to cool completely. In the bowl of your stand mixer, cream together the butter and cream cheese for about 2 minutes. Add the powdered sugar one cup at a time and mix until smooth after each addition. Mix in the coconut extract. One tablespoon at a time, add the coconut milk. Mix after each addition. You may or may not need all the milk. Add only enough until you reach your desired consistency. Once you reach that consistency, mix for 1 minute. Allow frosting to rest for a few minutes before frosting cupcakes. Core out the center of each cupcake using an apple corer. Fill each cupcake with the cherry pie filling. Using the Wilton 1M closed star tip, frosting swirls of frosting onto each cupcake. Sprinkle the tops of the frosting with red & blue sugar crystals. Place a fresh cherry, stem included, on top. Before serving, place each cupcake in a Bella Cupcake Couture cupcake wrapper. Do not overfill the cupcake liners with batter. These cupcakes puff up with big domes if you put less, rather than more, batter into each cup. And… for one of our readers we have a super fun prize pack for one of you to win! Over $325 in cupcake products to help you create the perfect 4th of July cupcake! Thanks to our amazing Prize Pack sponsors for their generous donations! Please, visit their websites to see more of their fabulous products! Contest opens 25June13 at 0700 PST and closes 1Jul13 at 2359 PST. One winner will be chosen and announced within 48 hours of the contest ending. Winner will be contacted via email by betsy@javacupcake.com and will have 48 hours to claim their prize. If they do not respond within 48 hours, another winner will be chosen. This contest is open to residents worldwide. Beautiful job as always. They look so good. Yum…love cherry and these look fantastic! I like the Olivia Swirl liners the best. Works for 4th of July and other events. The Olivia swirl are my favorites! I loved the Patriotic Stars and Stripes but I do think the Olivia swirls are way more versatile. Your cupcakes looked super good I might have to brave the heat and turn on the oven to make these!! I am ADDICTED to cherries right now so I’m loving this! Thanks for hosting again! These cupcakes are so pretty! I love the red velvet in the blue wrapper! Thanks for organizing again! Oh my, they look just wonderful – and that cherry on top is perfect! Fabulousness! And thank you for putting us all together again! What a great cupcake. 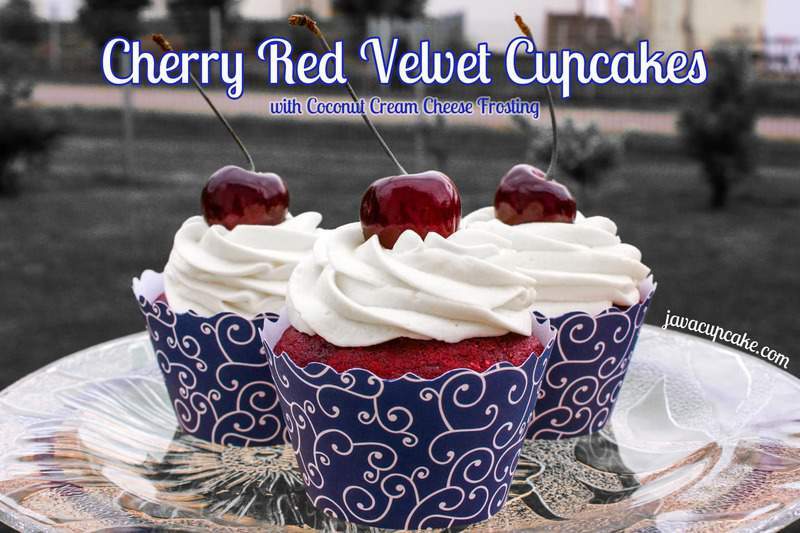 I love how you incorporated the red velvet, cherry and coconut. I could see how all three would pair so nicely together. Display looks so great with the cupcake wrappers too. Thanks again for also helping to coordinate the event too. Love the sounds of the coconut frosting, I love anything coconut and I bet with that cherry on the top it taste scrumptious. Thanks so much for putting this project together. Love Love Love the Olivia Swirl!!! Stars and stripes….. very patriotic for the 4th! The beautiful blue ones on the cherry cupcakes! Gorgeous! Cherry and coconut AND red velvet? These are over the top flavor fabulous and they look so beautiful in the wrappers. Prima! These cupcakes sound delicious! I can’t wait to make them. I’m loving the cheetah print Bella Cupcake Couture wrappers. My 2 year old granddaughter keeps telling me how pink is her fave color and her birthday is coming up. The theme is going to be lady bug and I am baking the cupcakes. I just came across your recipe for cherry red velvet cupcake recipe and it sounds great but I have a couple of questions. I happen to have Washington Cherry flavoring oil from the Lorann Co. I was planning on using that instead of cherry juice and am thinking of trying 3/4 tsp to the batter since it’s a strong oil. I want to leave out the red food coloring and tint the batter pink since it’s her “fave” color and I made red velvet ones for her brother’s birthday party. The cupcakes are going to be decorated with a daisy and a lady bug sitting on a leaf. How am I doing so far? Thanks for your recipes. I love your blog and always look forward to it. Oil is a lot different than juice… I’m really not sure if it would work. 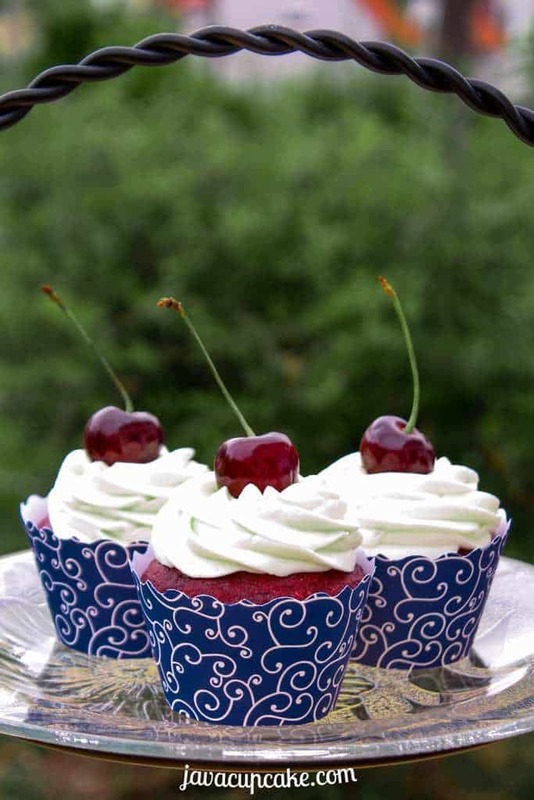 The recipe calls for cherries to be put inside the cupcakes after they are baked… no juice in the batter. So I’m not sure what you’d be doing with the oil. Also, you could definitely tint them pink instead of red! Test the coloring out in stages… start with less dye and add more as needed. I made these today for my grandma’s 94th birthday -I know they are meant to be a 4th of July celebration cupcake, but I’m in Australia, so I had to think of another excuse to make them…..and I am glad I did. Well done to you Betsy!!! There were delicious. My Gran loved them. Thank you!! That’s fantastic!! 🙂 I’m so glad you made these! I hope Grandma loved them! !